Hamby Home(in)stead ...: The fencing panel! You might be wondering what kind of gold-plated chook fencing we purchased that tallied nearly $600.00. Good question! 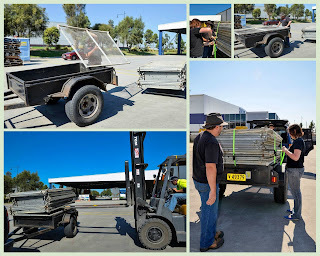 The day the girls arrived we headed into Bunnings for a 10 metre roll of 120cm chicken wire, four star pickets, some fencing staples (to attach the wire to the pickets) - and a gadget to assist hammering the pickets into the ground. That lot was $87.01 and probably one of the cheapest setups we could configure at short notice. We had previously purchased a small chicken coop from eBay. (By Nick's reckoning, it features as a cat expense so isn't included in the chicken keeping costs)! Accounting methods aside, the former cat coop was only intended to house two chickens at most (as a stand-alone unit) and was specifically noted not to be fox-proof. Our chookies are locked into the top roosting chamber overnight, with the coop door closed. Although a fox has been sniffing around, we believe they are safe when tucked up for the evening (albeit somewhat cosy). It is their daytime security that is more of an issue. We've been looking at fencing options and did some preliminary costings. It seemed a more convenient alternative was to buy fencing panels, so we set off to acquire some. Although we initially looked at the large format used around building sites, sense prevailed and we instead chose smaller units that (just) fit on our trailer! The frames are galvanised with aviary mesh inserts - far superior to chicken wire and star pickets! Our panels were advertised as being ex-hire with some minor damage, so afterwards we bought a swag of cable ties and some tie-wire to make the necessary repairs. Cable ties aren't cheap but they are easy to work with and that definitely appealed! When used as designed, the panels are 2 metres long and 1.2 metres high. For our purposes they were stood on end (so the measurements are transposed). Effectively we have 24 metres of 2 metre-high fencing for a little over $480.00. Obviously some work is necessary to transform our panels into what has been dubbed the "fox-proof fowl fort" but not nearly as much effort as would be required if building a fence entirely from raw materials. Some people buy convenience food - we buy convenience fencing!